CACH has purchased and developed 175 hectare property about 15 kilometres outside of Ladismith in the Western Province in South Africa. Together with Lesley's adjacent horse rescue centre, the consolidated property measures 250 hectares. Directions coming from George on N2. Drive on the N2 all the way to Riversdale. Turn right into the town and cross the railway line. Go straight up through the beautiful Garcia pass and about half an hour later, you'll come to a T junction which is at the R62. Turn right onto the R62. The next road left is the Laingsburg road. Turn left onto this road. Take the R 62 through Worcester, Robertson, Montague and Barry dale. About 10 km short of Ladismith, turn left onto the Laingsburg road. 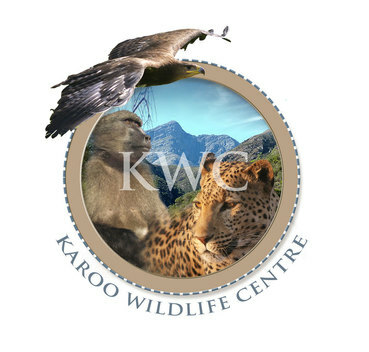 There is a Flag pole (no flag) and small white name board which says Karoo Wildlife Centre. Turn left on to the access road. The gate is locked over weekends so you’ll have to phone us before you get there so that we have time to get down and unlock the gate for you. Satellite phone 087 809 0071. Follow the road past the first farm house, go through the gate signposted ‘ Karoo Wildlife Centre’ and you will see the house up on the hill across the valley to the left of all the green water tanks. To establish a centre which will be able to rescue, rehabilitate and release injured and orphaned birds and wild animals which are endemic to the Klein Karoo. Internally funded breeding and release programs of designated endangered or threatened species, such as a vulture breeding program. Employment creation within local communities. Development of conservation education programs. Specifically, the new course on animal advocacy being offered by CACH director Chris Mercer.. Promotion and use of alternative energy (solar) as a sustainable power resource. How will we fund the Centre? Tragically, Bev died from cancer on 30th April, 2016, and the planned volunteer program died with her. But now CACH is offering a unique experience for volunteers - an opportunity for animal lovers who really want to make a difference. Why CITES is worse than useless. Comfortable in-house accommodation and all meals will be provided. Course participants will have plenty of leisure time to roam over the sanctuary’s 250 hectares of fynbos wilderness. They may hike through the surrounding hills, star-gaze the Karoo sky, receive instruction from Lesley on horse communication, and help with sanctuary tasks.